Reform of the United Nations is “around the corner” and will force Europe to accept less influence on the Security Council there – senior diplomats within the institution have told EURACTIV. The development comes as the EU’s External Action Service (EEAS) responded to criticism that its observer status within the institution has downgraded its voice there. “The Security Council as it is constituted today (see background) does not reflect contemporary reality, and therefore it lacks full credibility,” the Indian ambassador to the UN, Hardeep Singh Puri, told EURACTIV. “I have personally no doubt that reform is around the corner,” he added. Although many diplomats at the UN are unconvinced that reform is possible soon, another senior UN diplomat said that the present system of European representation there “is not tenable” and any reform will compel the continent to re-think its approach radically. “There are too many European seats – with Britain and France being permanent members of the Security Council and Europe having the possibility of taking 30% of the total seats,” the diplomat said. The comments come as EURACTIV was told by an EU diplomat, that EEAS’s new status as observer relegated it to speaking after the other nations and thus decreased its ability to be heard. The diplomat claimed that although EU leaders are now permitted to address the UN's General Assembly, the EU's new 'observer status' had diminished Europe's voice. Individual member states representing the EU as presidency nations previously spoke higher in the pecking order and carried more clout, the source said. The diplomat also said that the UK was also adopting a difficult stance in the UN since it refuses to allow the EU to speak on its behalf on issues where it deems itself to have a national interest. In relation to the EU's new status at the UN, EU Ambassador Thomas Mayr-Harting insisted that it represented an important step forward. He said that it had certainly not diminished Europe's voice at the UN, but rather provided for greater continuity, through the EU's institutional representatives. “It also offers greater opportunities for synergies between the various fields in which the EU and its members are active at the UN. The EU as one of the major political groups at the UN is getting its voice heard across a very broad spectrum of issues, from the political challenges in the Middle East and Africa to humanitarian aid and development,” said Mayr-Harting. The EU ambassador said that questions on reform covered a wide variety of areas. These range from the Security Council – where there is no agreed EU position – to issues surrounding administration and the budget, where there is more common cause among the member states. Budget issues are “a special case”, Mayr-Harting said, since EU member states individually contribute almost 40% of the total regular and peacekeeping budgets of the UN. “I think that, the UK included, everyone agrees that sometimes even where there is an exclusive competence of member states, such as on the budget, it may make sense that we co-ordinate and speak with one voice because it is in the interests of taxpayers in every single member state of the European Union,” he added. “Reform will not come because the permanent members [of the Security Council] want it, but because of traction in the General Assembly,” according to the Indian ambassador to the UN, Hardeep Singh Puri. “If there was a vote tomorrow in the General Assembly for reform, which of the permanent [Security Coucil] members would turn around and say ‘we will not agree’? Because that would be an expression of popular will of the whole assembly against the narrow interest of individual countries. There has never been a vote in the General Assembly. Negotiations have been going on. I am not saying something will happen today or tomorrow but we are very close to decision time,” said Singh Puri. “The reform agenda here is something that is broader than just the Security Council,” said the EU’s ambassador to the UN Thomas Mayr-Harting. “There are many areas where the EU has a strong interest, such as the UN “delivering as one”. The UN is a family of agencies and sub-structures and the EU often uses the UN as a channel for its humanitarian and development co-operation. We therefore have no interest in duplication of these structures, so the UN could improve its performance there, and that is where we have an agreed position and where we speak strongly with one voice,” said Mayr-Harting. “People are beginning to ask questions [about reform],” an anonymous senior UN diplomat told EURACTIV. “This is based on a victory 65 years ago, and questions such as ‘If the Germans can bail out Greece, then how come they are still denied a seat as one of Europe’s strongest countries’ are being aired in the corridors of the secretariat,” the anonymous source added. The United Nations was constituted by Charter in 1945. Its Security Council has five veto-wielding permanent members – the victors of the Second World War: China, France, Russia, the UK and US – and 10 elected non-permanent members with two-year terms. The non-permanent members are selected from groups which reflect the world’s division at the height of the Cold War, and this means that there is a possibility – as has happened in the past – that there can be five EU members on the Council: the two permanent members, two non-permanent from the ‘Western European and Other’ group and one non-permanent from the Eastern European group. Since Cyprus is within the Asia-Pacific group, it could theoretically join five fellow EU members on the Council. India, South Africa and Brazil have long been agitating to change the structure, along with Japan and Germany. A two-thirds majority vote of the General Assembly is required to reform the institution, but a vote has never been placed before the Assembly, so far. I don’t understand how the EU can be or become a member of the UN – United NATIONS!! The EU is not and hopefully will never be a “nation”. 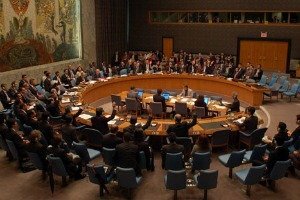 There are no Asian, or African seats on the security council. Hopefully, there will never be an EU seat either. Yes I agree with Mayr-Harting this i a very important issue tu be defined; I also agree that it is a precious opportunity to develop new synergies between the countries, about all the international important issues in which the EU and its members are very active at the UN, becouse the EU has one of the major political representations at the UN, doing hard strugles to have their positions knowed about a large and increseng menu of international themes.